The basic components for this build are all in place, now it is time to add in the parts that pull it all together. Next up was to fit the buttplate, the top half of this is fixed in place but the bottom folds in to help the rifle pack up smaller for transport. In the folded position. Once the cushioned pads are in place it won’t fold quite as far as this but it allows it to fold a lot closer than it would otherwise. I have now planed the stock down to its rough shape, adding the grooves with the router. If I was doing this again, I would definitely make these grooves sooner as achieving a straight and level cut on this shape is quite tricky! The forestock needs another mounting point further back to really solidly hold it in place, I expect I will have to make some kind of band that slips around the action as the bottom of the tubes at the chamber end are all cut open to hold the airsoft parts. It may make sense to combine this with the rear sight, which is still yet to be mounted. The rear sight fitted in position. This is welded into place on the front. I decided not to use this at the attachment point, instead adding a second screw well behind the first one. Taking the buttstock home, there are a couple of bits of fabric work for this build. Firstly, the leather cheek rest, presumably added to keep the cheek away from cold metal. It certainly doesn’t provide any great cheek weld. The second part is the cushioned buttpad, to absorb the not insignificant recoil on the original! The leather cheek rest is laced on so it can be removed easily. The originals were sewn on but this looks the part and makes it easier to remove and maintain. I have to make the carry handle covers, fit the foresight and re-assemble to paint it, but that’s the majority of work to come. In the meantime, the trigger unit cover and pistol grip. I already welded the grip together, at this stage I used a bolt to line up the hinge points and the grip over the cover plate. This can be tacked down so the whole unit swivels as one. In place. The receiver was slightly out of square, so I used a clamp to hold it in place while I made adjustments. Although the pivoting grip unit doesn’t cycle the action like the original, it will be useful for disassembly. It opens much like the original. At the front, I now have a cover plate for the magazine well, which can be swivelled aside to access the magazines and change them. The next step is to make the new bolt action. This allows the bolt to be used without cutting out a section at the side of the receiver. The front section locks the breech and operates the out of battery safety. The knob at the back keeps this in place and allows the user to grip the bolt to operate it. The receiver of the donor rifle (a VSR clone) screws into the receiver of the rifle. The top of the receiver is welded in place, as are the thick back parts of the barrel. These also support the weight and hold the position of the internal parts. Slowly, I add on the rest of the barrel. To simulate the tapered barrel of the original I am stepping it down slightly along the length at opportune positions. This thing is now huge. It is already longer than the G98, even without the buttstock attached! The next job was to rough fit the woodwork. This is always very challenging, especially for the VSR rifles. Apologies for the quality of the pictures here, my camera was out of action so resorted to the ‘phone! This is important, the carry handle makes something like this just about portable. I bent two pieces of steel to shape by hand, two screws hold them together at the top. I will temper the steel so that it is stiff enough to hold the weight of the gun. And the buttstock is screwed into place. I will be modifying the top screw so that the stock can be folded and unfolded easily. The next few steps are to shape and finish the woodwork, screw said woodwork into place and mount the bipod, foresight unit and buttstock lock. In the meantime, I am looking forward to getting this finished, it’s making my gun rack look comically small! After some extensive design work, laser cut parts and some timber start off the build! I started by bending the buttplate components. Part of this folds down to make a more compact package. I designed this with tabs and etched lines to make folding as precise and easy as possible. I could then weld the parts in place to maintain they shape and increase the strength of the parts. I then welded the inner pieces of the receiver and the buttstock hinge unit. This pivots to shorten the length of the weapon to make it *slightly* more portable, such as anti-tank rifles ever are. A piece of steel tube makes the rest of the back of the unit. It will be welded onto the top part of the buttplate. Here you can see the outer plates of the receiver in place, which stops the stock from folding up over the gun when in use. The pistol grip and trigger guard unit. In the original this is used to open the breech and eject the spent case. In this version sadly it won’t be possible to do this, but it will be used for disassembly. For the front end, the bipod unit is coming together, to keep it light and strong the legs and feet are thin gauge steel plate, folded and welded into shape. These will then be attached to the hinge which is thicker steel for strength. The anti-tank rifle was, for many years, the only device capable of disabling a tank. In the Great War, British tanks were faced with the German T-Gewehr, a huge single-shot, large calibre Mauser rifle, which was moderately effective at short ranges but resultantly terrifying to use. Combine this with the shoulder-destroying recoil and this was a less than satisfactory solution. The T-Gewehr itself was supposed to be a stop-gap until Germany could bring its anti-tank machine-gun into production and deploy it. However the end of the war came before this could happen and as a result the only infantry anti-tank technology anyone had seen in action was the T-Gewehr. 0.55 inch Boys Anti-tank rifle. In the inter-war period, some development was carried out by all major nations into infantry tank-destroying technologies, all based around the anti-tank rifle. The only other option was the small artillery piece carried by infantry regiments. By the opening of WWII, the most prominent anti-tank rifles were the British Boys rifle, Finnish Lahti, Polish Model 35 and the German PZB 38 and PZB 39. Polish Model 35. Probably the best anti-tank rifle of WWII. Not that it did much to help them. The PZB-38 was intended to be Germany’s main anti-tank weapon when introduced, but it proved expensive and complex to manufacture. It was replaced by the PZB-39 as a consequence. The first thing to note about this rifle is that it is huge. Absolutely massive. 1605mm long. This is one of the downsides of anti-tank rifle technology, they have to have a powerful cartridge, which needs a strong chamber and receiver, plus a long barrel to build the necessary velocity to penetrate armour. As a result of this size, steps were taken to make it as portable as possible. The buttstock folds under the gun, such as it helps. The second thing to note about this rifle is that it is single shot. Every time to fire, you must open the breech and load a new cartridge, all manually. The action is a falling block, not dissimilar to that used by the Martini-Henry. It is opened by pushing the pistol grip forward, which pivots down at the front of its mounting. This ejects the spent cartridge and allows you to replace it. The two large boxes on the sides hold the ammunition, which is held in spring clips within. While anti-tank rifles were the only option available in the early war, they were really defunct even before it started. Only hits on a few critical areas of a tank could disable it, and these were quite unlikely under the stress of combat. The Finns had some success with Boys rifles against Soviet tanks during the Winter War, but by 1941 During Operation Crusader (the relief of Tobruk), there was not a single incident of a tank being disabled by the rifles. The Germans took their anti-tank rifles into Russia, expecting Russian armour to fail readily, though they were disappointed in this not being the case. As a result, many of the surviving PZB-39s were sent back and re-purposed into grenade launchers in the form of the Granatbuchse (GrB) 39. In service, these were both effectively replaced by the Panzerschreck and the Panzerfaust which were far superior, and in the case of the former was widely copied. For those interested in learning more about the PZB-39, you should check out Forgotten Weapons’ video on one of these rifles. 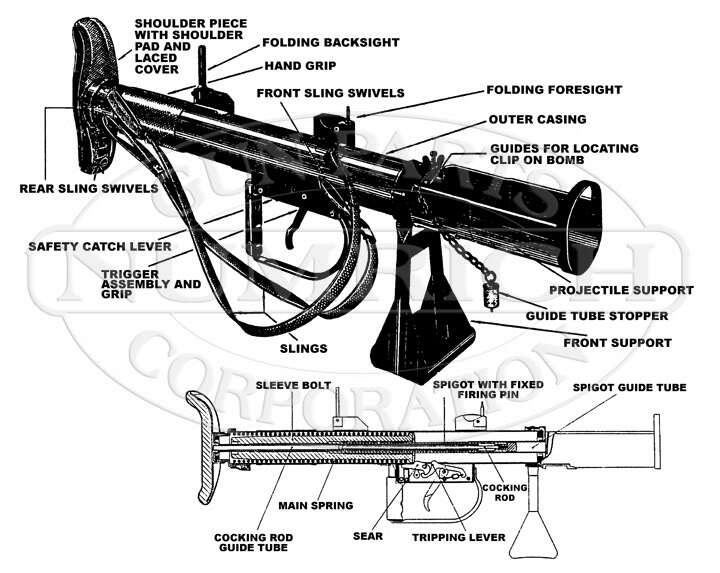 You can also see the video about the GRB-39 grenade launcher. For those of you who have been following the blog for some time, you may remember the first rendition of the LAW M72 light anti-tank weapon built out of plastic tubing and fibreglass. Since then Vintage Airsoft has been working slowly in the background on several anti-tank weapons including an improved version of the LAW. When we say a while, we mean it. This is a photo of the new trigger mechanism housing being bent into shape in the old workshop. When products are in development, they undergo a LOT of tweaking and changes in design, this photograph is a case in point. A dramatic change to the design of the shell meant that the original spacer would no longer fit, making it time for a gaffer-tape based solution. One of the modified trigger units straight after being brazed. This is the sear bar straight after being brazed. The protrusion nearest the camera is the sear, which is pushed down inside the tube above and allows the bar to slide forward under spring tension. The sear unit in position under the trigger mechanism housing. At the back is the wire that actuates the firing pin. The new trigger mechanism. The transfer bar is pulled forward by a tension spring and is controlled by a sear activated by the trigger. In place on the launcher, the tabs attached to the trigger unit can be welded down. The trigger unit can still be removed by undoing the screws and lifting straight out for servicing. There is also a tab that lines up with the hole in the cocking handle through which an R-clip or pin will be inserted as a safety catch. And finally, painted up for testing! This will be painted green for production, but as it is a prototype the finish just needs to protect it from the elements. Oh, for those of you who want to see/hear the dry-firing….